Annotation: Lizzie Bennett’s doesn’t believe in obsessing about prom – she rather focus on her music, but why can’t she stop thinking about popular, pompous Will Darcy? Plot Summary: This Pride and Prejudice reinterpretation takes place in a modern day Connecticut at the very fancy, very posh Longbourn Academy. Lizzie Bennett, a scholarship student and musical prodigy, cannot stand most of her rich classmates and vice versa. When her best friend Jane drags her to a party she encounters snobbish Will Darcy. She automatically labels him as another rich jerk. But they keep running into each other as Jane and Will’s best friend Charles spend time together. Critical Evaluation: The plotting of the book is very parallel to Austen’s Pride and Prejudice, except for the time change. However, what was missing is the depth of emotion. While this adaptation is adorable and fun, it lack the emotion in Austen’s story and the characters seemed mainly shadows of Austen’s. Especially Will Darcy. Sometimes the events felt designed to follow the Pride and Prejudice plot and did not naturally fit the modern day setting of the story. It felt more like a modern outline of Austen’s book. There is a bright light to this and it’s the witty dialogue. The characters are very well spoken and kept the story flowing. The dialogue does not lack, nor does Eulberg ramble on for hours. It’s perfect for teenagers looking for a fluffy, fun read and hopefully it will introduce a whole new generation to Austen’s Pride and Prejudice and prompt them to read the original. Author Bio: Elizabeth Eulberg was born and raised in Wisconsin before heading off to college in Syracuse and making a career in the New York City book biz. She is the author of The Lonely Hearts Club, Prom and Prejudice, and Take a Bow, as well as Revenge of the Girl with the Great Personality. You can find her on the Web at http://www.elizabetheulberg.com. (via book jacket). 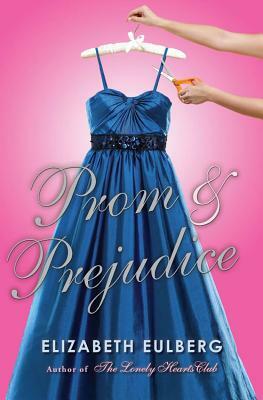 Challenge Issues: As an Austen retelling, Prom & Prejudice can be a bridge in navigating and understanding the original classic as Eulberg states in this interview . Kirkus also states that “Eulberg’s adaptation is faithful without being dogmatic; she successfully translates the essential elements of Austen’s narrative into 21st-century dialogue and descriptions and still leaves enough room for play with the details”.